According to estimates from 2015, peripheral vascular (PV) diseases are the first and third most prevalent conditions in the United States. Combined, there are an estimated 60 million people within those two condition categories. The Centers for Disease Control and Prevention projects a lower number of Americans with peripheral artery disease (PAD) at 8.5 million, but acknowledges that only 25% of those with PAD are actually diagnosed (Figure 1). Thus, this number would significantly increase in line with the estimates from the 2015 study. Figure 1. Prevalence of PAD (%) by age group (years). Adapted from the Centers for Disease Control and Prevention PAD Fact Sheet. These are very big numbers with only a fraction being diagnosed or, more importantly, treated. The significance of this population beyond just the disease itself is its correlation to other serious conditions such as heart attack and stroke; left untreated, PAD can lead to amputations and death. Unfortunately, there are strong signals that the provider workforce that traditionally treats this population will be stressed for capacity in the coming years. 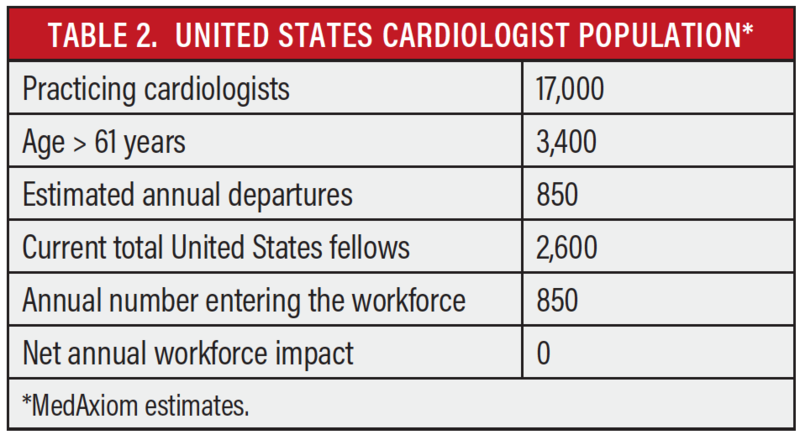 Likewise, cardiology is another specialty that treats a significant portion of the PAD population, and the supply of cardiologists looks thin for the coming years. 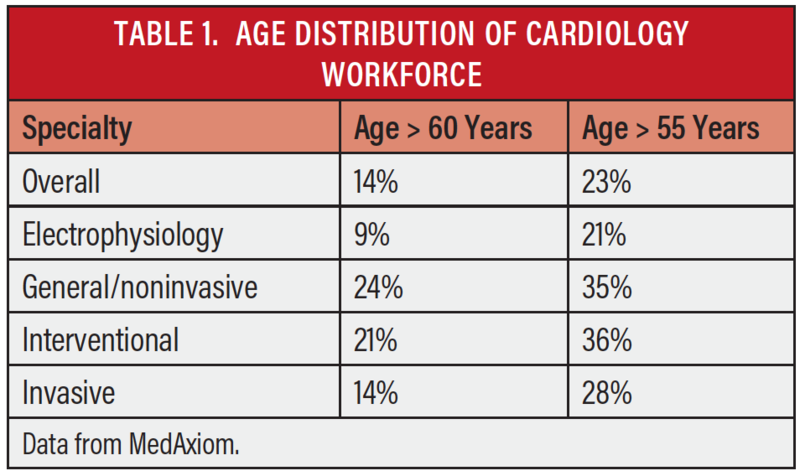 Table 1 shows the age distribution of the current cardiology workforce. Overall, nearly 25% of the workforce is aged ≥ 55 years; in the interventional population, which provides the catheter-based treatment of PAD, more than one in five operators are aged > 60 years. Because of the rigors of the cath lab, this age group is more likely to give up invasive clinical duties or leave medicine entirely. Similar to the vascular surgery population, our cardiology fellowships will likely simply replace the population leaving the market, even as the demand for services expands (Table 2). Although the shortages of providers are concerning, the projected shortage of primary care in the United States is alarming.3 The bottom line is that we cannot expect significant management of PAD from our primary care sector any time soon. With such a large population of undiagnosed disease, there is likely much we do not yet know about the PAD population, but what is well understood is that there is tremendous variability in patient care. Using Medicare data on acute myocardial infarction patients as a surrogate for PAD, Figure 2 shows the normalized average Medicare spending for 18 hospitals in the same geographic region. The data show average spending per patient as low as $13,000, all the way up to nearly $25,000—a nearly 2:1 differential. 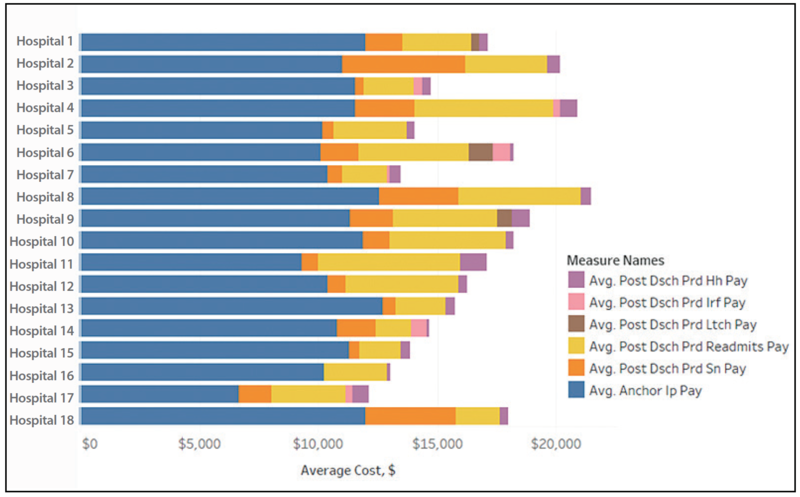 Furthermore, you can see the breakdown of costs by category, with significant variability in each individual class as well. These data unequivocally point to differences in care and treatment. Figure 2. Normalized average Medicare spending on acute myocardial infarction for sample geographic region (according to CMS data). Adapted with permission from Archway Health. The provision of PAD care in the provider community is also fragmented, with three main groups filling the need: cardiology, interventional radiology, and vascular surgery. Historically, these three specialties resided in separate physician practices (legal entities) with strong competition in providing the same services to the same patient populations. Early discussions around collaboration between these groups often center on clinical guidelines and differences regarding the most appropriate interventional approach. However, the reality is that it is not the clinical approach that has supported the competitive divide, but rather the economic misalignment where a lost patient or procedure is lost revenue. With the advent of physician practice integration into hospitals and health systems, multispecialty groups, and large integrated delivery networks, many of these programs find two if not all three of these specialties under the same organizational leadership. Yet, the majority still practice in a competitive and siloed manner. This has created a confusing referral process for primary care and, at times, an inefficient utilization of physician resources in which three separate programs are each managing different portions of the continuum of care, often for the same patients. These clinical inefficiencies carry over to the facility side, where very expensive resources are often duplicated. It is not uncommon to find three different labs (cardiology, interventional radiology, and vascular) maintaining separate supplies, support teams, and utilization patterns. What all of this points to is the need for a consolidated, focused, and programmatic approach to identifying, treating, and following the PAD population. Such a program is not only good for patients, but can be good for volume growth as well, which can lead to bottom line growth. In an era of declining or, at best, stagnant cardiovascular volumes, this is a true win/win. Building a proactive, comprehensive PAD program begins with understanding the patient population that is being targeted. These patients are often symptomatic but undiagnosed, even in our cardiology programs. Assessing the opportunity involves two levels of review: (1) quantifying local disease prevalence and (2) estimating the number of patients who are currently underdiagnosed or undermanaged. The Centers for Medicare & Medicaid Services (CMS) provides great prevalence data for coronary artery disease (CAD), diabetes, and tobacco abuse—all good surrogates for estimating PAD populations based on Medicare beneficiary claims data. As previously mentioned, it is estimated that 30% of CAD patients also have PAD. Risk factor prevalence can also provide insights to underdiagnosed or undiagnosed disease. For a good understanding of patient identification and management within the market, an assessment of current PAD identification practices should be performed. For both cardiology and primary care, this means review of patient rooming processes including physical examination practices, review of systems questions, screening questions, and patient education. This will allow appropriate patient identification. If PAD symptom questions are not routine, lower extremity examinations are not common, and there is no patient education on PAD, the likelihood is high that patients are underdiagnosed. One program noted that their number of PAD cases increased in the summer months, as patients are more likely to present in shorts, and physical examination findings are more apparent. Although anecdotal, this highlights the importance and effectiveness of a formalized and systematic approach to PAD detection. In addition to examination room processes, another good way to quantify your potential PAD volume opportunity is to calculate the number of patients in the cardiology practice with active CAD against the number with active PAD. This can be accomplished through an electronic medical record query or other search. If this ratio is < 30%, then opportunity exists and you can estimate the difference mathematically. Amputation rates are also a potential sign of undertreated PAD. If you find yourself in an area of the country where amputation rates are high (ie, the South and southeastern United States), consider whether PAD is not being identified and/or is being treated too late. In addition, it is often very productive to meet with wound care specialists and hear their thoughts around the opportunities in PAD treatment. Some states’ health departments mandate the submission of discharge and outpatient volume data from hospitals. These data are often then available for purchase and are a wealth of market intelligence when developing new programs. If you are fortunate enough to have access to such data, you can use the previously described methods to estimate the potential of the entire market and then overlay these against your current shares. This will provide a very complete picture of the PAD opportunity and provide “reality checks” for volume estimates. These patients require chronic disease management with close surveillance and secondary prevention strategies. In addition, their comorbidities are often numerous and care coordination is imperative. Staffing to provide the highest-quality care is best managed through a team approach. The physician, advanced practice provider (APP), and registered nurse (RN) coordinator all have important roles. The physician develops the plan of care and provides procedural intervention. The APP facilitates the plan through routine follow-up, periprocedural care, and risk factor modification. The RN role ties everything together through telephone-based support, care coordination, and navigation of the program. With volume projections calculated, you can now put together a financial pro forma to determine the margin potential for your PAD program. As part of this calculation, it is important to understand the differences in reimbursement based on the setting of care for the PAD patient. Table 3 lists the current Medicare facility payments for atherectomy and nonatherectomy cases between an office-based lab (OBL) and a hospital outpatient department (HOPD). 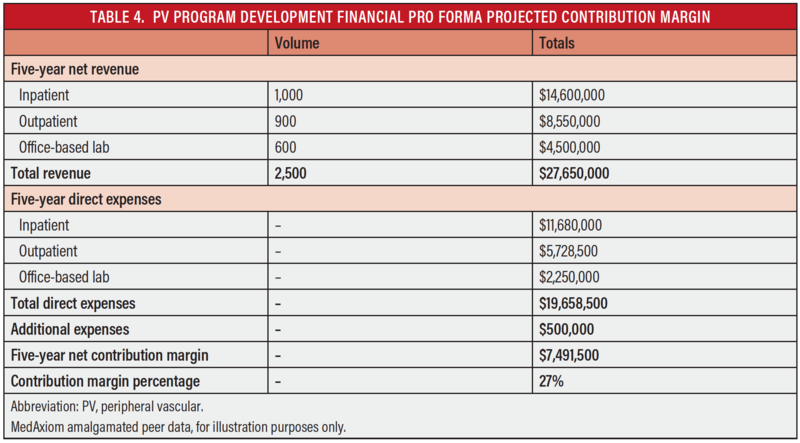 Although the knee-jerk reaction to this table may be to consider steering all volumes to the HOPD setting, where the hospital reimbursements are significantly higher than the OBL, it is important to consider that margins can be higher in the OBL because of lower cost structures. Furthermore, our third-party payors and, perhaps more importantly, our patients are getting much more engaged in pushing care to the lowest cost setting. If competitors offer a lower cost of care, you may be at a disadvantage by creating your own volume growth headwinds. Thus, when developing your financial projections, it is critical to look at the entire picture and not just a single element. As you consider your model, you may want these three care settings available: inpatient hospital, HOPD, and OBL. At the risk of making this overly complex, there is even a fourth care setting, the ambulatory surgery center (ASC), that may make sense as well. This takes on greater potential as increasing numbers of cardiac procedures become eligible for reimbursement in these facilities. Utilizing historical data from all available sources, you can sketch the potential financial picture (Table 4). At this stage in the process, it is important not to get too bogged down in the pro forma development because the purpose is to determine whether there is enough opportunity to justify continued effort. This is not advocating carelessness but is recommending high-level analyses to get to a go/no-go decision and help suggest a model. Presuming that the financial projections show a motivation to move forward, the next step is to determine the right model to create economic alignment between the parties and ensure a sustainable program. Although myriad tools are available, some of the more common tools include full employment, professional service agreements (PSAs), joint ventures, comanagement agreements, or a mix of all of these. For the sake of illustration, let us presume a fictitious scenario in the southwest United States where a health system has identified a significant underserved PAD population in its service area. It currently employs cardiology, whereas both interventional radiology and vascular surgery are in separate private groups. Despite these complexities, the preliminary analyses have determined that the best option for success would be a program that includes all three groups. In this scenario, in which there are three distinct and economically divided entities, one or several of the previously mentioned models may make sense. Because PAD care would only represent a fraction of interventional radiology’s total care continuum, and given that partial PSA models are considered legally risky by some, a PSA may be ruled out. However, a joint venture alone or with a comanagement agreement could tie all parties together both economically and clinically. Furthermore, it would provide a legal framework for future third-party risk. Figure 3 provides an illustration of a straightforward joint venture model. Figure 3. Sample joint venture model. PFS, physician fee schedule. The joint venture would be based around the facility and technical aspects of PAD procedures. To be versatile in the market, it would be organized as a physician group and provide services under the professional fee schedule. If built to appropriate specifications, the lab could then operate as either an OBL, ASC, or a combination of the two. Although an ASC can also be an OBL, the converse is not necessarily true. Few OBLs are built to the higher specifications required for ASC designation. Because there are obviously cost differences between the two, careful analysis is required to determine the right facility. In addition, approximately half of states have Certificate of Need requirements that may come into play, so research should be conducted to ensure compliance and accurately capture timelines and cost. Using the same fictitious scenario, let us presume the health system draws a different conclusion and decides to build a program around cardiology and vascular surgery. Although employment was explored, it was rejected by the vascular surgeons. Given these circumstances, it may make sense to employ a PSA model along with comanagement to provide a framework of economic alignment along with clinical oversight. Figure 4. Sample comanagement program. IDP, individual development plan; wRVU, work relative value unit. 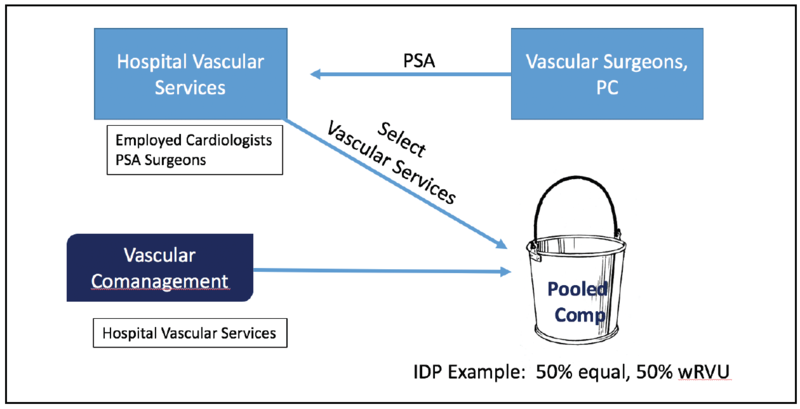 The PSA would allow the hospital to put the vascular business provided by the cardiologists and that of the vascular surgeons into a common compensation pool. This pool could then be distributed in an agreed upon manner that reduces the competitive aspects of who performs the cases. The comanagement program can have oversight of setting and achieving quality, as well as cost and service performance for the service line (Figure 4). Under the right circumstances, the model shown in Figure 4 could also include a joint venture on a vascular facility, as previously described. When creating health care partnerships or arrangements between physicians and hospitals, there are myriad state and federal laws that come into play, along with fair market value considerations, so it is critical to consult the appropriate resources before consummating any arrangement. Today in cardiovascular care, there are few areas that can provide significant volume growth potential. One rare exception is the PAD population. This population is largely underserved in the United States, and this lack of care can lead to poor outcomes. Thus, for a program of substantial size, PAD is a patient group that is ideally suited for a standardized and organized programmatic strategy. Too often, we may think of the PAD population simply as procedures, but so much more is required to provide excellent patient care and solid financial performance. To determine whether a PAD program is right for you, first assess your market and attempt to quantify the untapped patient volume. Then, using these estimates, create high-level financial models to determine potential financial performance. These financial pro formas should provide enough information to make a decision about whether to pursue a program and what level of effort the returns justify. Presuming a decision is made to move ahead, the right model will need to be determined—one that provides a framework to standardize and improve care delivery, while at the same time eliminates or mitigates competitive and misaligned economic barriers. With all such arrangements, appropriate legal and fair market resources should be consulted. 1. Kalbaugh CA, Kucharska-Newton A, Wruck L, et al. Peripheral artery disease prevalence and incidence estimated from both outpatient and inpatient settings among Medicare fee-for-service beneficiaries in the atherosclerosis risk in communities (ARIC) study. J Am Heart Assoc. 2017;6:e003796. 2. Association of American Medical Colleges. The complexities of physician supply and demand: projections from 2016 to 2030: final report. https://aamc-black.global.ssl.fastly.net/production/media/filer_public/85/d7/85d7b689-f417-4ef0-97fb-ecc129836829/aamc_2018_workforce_projections_update_april_11_2018.pdf. Accessed September 24, 2018. 3. Association of American Medical Colleges. The complexities of physician supply and demand: projections from 2013 to 2025: final report. https://www.aamc.org/download/426248/data/thecomplexitiesofphysiciansupplyanddemandprojectionsfrom2013to2.pdf. Accessed September 11, 2018.